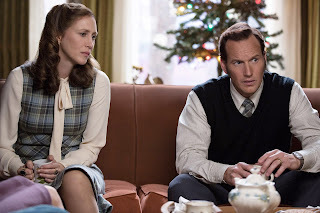 Rotten Tomatoes Plot: Reprising their roles, Oscar nominee Vera Farmiga (Up in the Air, TV's Bates Motel) and Patrick Wilson (the "Insidious" films) star as Lorraine and Ed Warren, who, in one of their most terrifying paranormal investigations, travel to north London to help a single mother raising four children alone in a house plagued by malicious spirits. Directed by James Wan. Lorraine confesses, "There isn't much that rattles us anymore. This one still haunts me." Judging by all the screams & shouts at our screening, it's likely to haunt you as well. The Conjuring 2 is a great sequel, one that manages to hold its own identity... as well as its audience's attention for 2+ hours. Credit Wan for pushing all the right buttons, and Farmiga/Wilson for providing much-needed credibility and star power. It loses a bit of steam towards the end; but I was near the edge of my seat throughout. No senseless gore either. Bring on #3!